Julia Louis-Dreyfus is honored for a sixth time for her HBO role as a self-absorbed vice president, tying with Cloris Leachman as the most-winning Emmy performer ever. 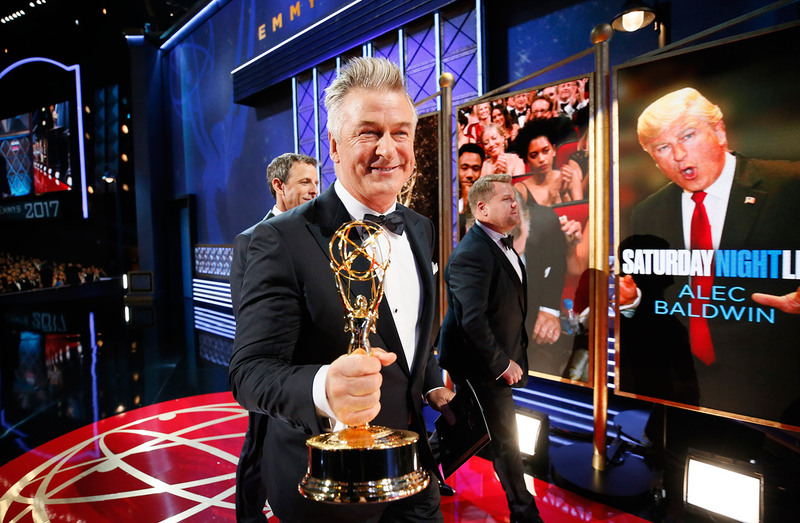 LOS ANGELES — The dystopian vision of “The Handmaid’s Tale,” the deeply cynical Washington comedy “Veep” and the ever-topical “Saturday Night Live” won top series honors Sunday in an Emmy Awards ceremony that took almost nonstop aim at President Trump in awards and speeches. “Nineteen years ago, Detective Frank Pemberton held this,” Brown, holding his Emmy aloft and saying it was his “supreme honor” to follow Braugher. He was good-natured as the orchestra cut into his speech, but it seemed a glaring misstep on a night in which the TV academy reveled in the industry’s newfound diversity. “Big Little Lies” won the limited series award, with Kidman taking the lead actress award and supporting honors going to her cast mates Alexander Skarsgard and Laura Dern.